The Harley-Davidson V-Rod fairing attaches to Memphis Shade Adj. Clamp Brackets and we must know the Fork Tube Size. 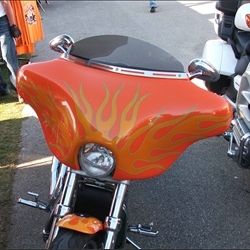 The fairing will not mount to the Harley Davidson Quick-Release Detachable Windshield brackets. This fairing is very tight around the Headlight due to the oval shape of the headlight. The headlight needs to sit on the bottom triple tree. Stock handlebars have no problem. Memphis Shade Part#: Mem9954 48mm-55mm for the inverted forks. Customers have put this fairing on a Night Rod, V-Rod Model B, V-Rod VSRC, and Rocker C 2009.